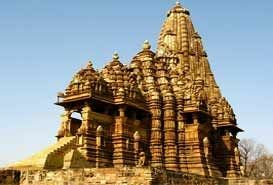 The Khajuraho Temples located in the Chhatarpur district of Madhya Pradesh has a number of marvelous medieval Hindu temples. The sculptures and architecture of the temples are very well known and makes Khajuraho a popular tourist destination in India. 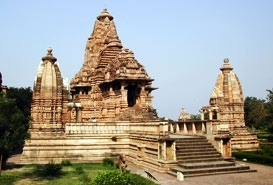 The Khajuraho Temples can be divided into Eastern Group of Temples, Western Group of Temples and Southern Group of Temples. 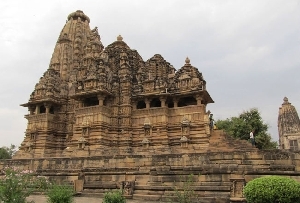 Kandariya Mahadeo it is the largest temple in Khajuraho which is dedicated to Lord Shiva. The height of the temple is 31 meters. The depictions of gods and goddesses on the main shrine are very popular. 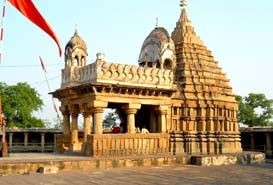 Chaunsat Yogini Temple is the popular granite temple of Khajuraho which is dedicated to Goddess Kali. Lakshamana Temple dedicated to the trinity of Brahma, Vishnu and Shiva, the temple is well known for the three-headed idol of the incarnations of Vishnu. The incarnations of Vishnu are Narasimha and Varaha. Vishwanath Temple this temple is enshrined the three headed image of Brahma.